Sometimes when I visit my local bakery, I bypass all the fancy desserts, and go straight for the Chocolate Peanut Butter Bars. 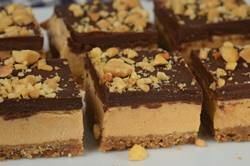 I just love the combination of dark chocolate and peanut butter in this three layer bar. The top layer is a smooth and shiny Chocolate Ganache covered with crunchy bits of peanuts. Next comes a no bake Peanut Butter Filling that's deliciously soft and fluffy with a creamy smooth texture. The bottom layer is a sweet and grainy Graham Cracker Crust that contrasts so nicely with the creaminess of the top two layers. My favorite way to eat these bars is cold from the fridge but they are also good at room temperature. A Graham Cracker Crust is one of the easiest crusts to make. While you can buy Graham Cracker Crumbs, I prefer starting with whole Graham Crackers (homemade or store bought). Then either place the Graham Crackers in your food processor and process until finely ground, or put the Graham Crackers in a freezer bag and use a rolling pin to crush until finely ground. Next, just add the sugar and melted butter and mix until moistened. Once the mixture is placed in your baking pan, there are two ways to set the crust. One, is to chill in the refrigerator, but my preference is to bake it until golden brown and firm. Cool completely before pouring on the filling. For the peanut butter filling the ingredients are just beaten together until light and fluffy. Peanut butter is a smooth paste made from roasted peanuts. The peanuts are ground, and then salt, a sweetener, and sometimes a stabilizer (to keep the oil from separating) are added. There are two types of peanut butter, and the ones that are labeled "Old-Fashioned" or "Natural" do not contain a stabilizer which means the peanut butter will separate. For this recipe I find it best to use a peanut butter that contains a stabilizer. Lastly, if you want to make a larger batch of these Bars, simply double the recipe and use a 9 x 13 inch (23 x 33 cm) pan. Graham Cracker Crust: Preheat your oven to 350 degrees F (180 degrees C) and place the oven rack in the center of the oven. Line an 8 inch (20 cm) square baking pan with foil. In a large bowl, mix together the Graham Cracker Crumbs, sugar, and melted butter. Press onto the bottom of the prepared pan. Place in the preheated oven and bake for about 10 - 12 minutes or until firm and just beginning to brown. Remove from oven and place on a wire rack to cool. Peanut Butter Filling: In the bowl of your electric stand mixer, fitted with the paddle attachment (or with a hand mixer), beat the butter until smooth. Add the peanut butter and beat until blended and smooth. Add the sugar, vanilla extract, and cream. Beat, on high speed, until light in color and soft and fluffy (about 2 to 3 minutes). Scrape down the sides and bottom of the bowl as needed. Pour the filling over the cooled crust and smooth the top. Cover loosely with plastic wrap and place in the refrigerator for about 2 hours or until firm. Ganache: Place the chopped chocolate in a medium sized heatproof bowl. Set aside. Heat the cream and butter in a small saucepan over medium heat. Bring just to a boil. (Can also heat the cream and butter in the microwave.) Immediately pour the boiling cream over the chocolate and allow to stand, without stirring, for a few minutes. Stir gently (as you do not want to incorporate air into the ganache) with a spoon or whisk until smooth. Let cool slightly and then pour the ganache over the peanut butter filling. Sprinkle with chopped peanuts, if desired. Cover and place in the refrigerator until chilled. The Bars will keep about one week in the refrigerator or they can be frozen. Serve in small slices as they are quite rich. Makes about 16 to 20 bars.